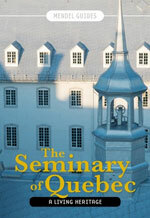 The Seminary of Quebec / A Living Heritage David Mendel After Quebec, World Heritage City and Quebec, Birthplace of New France David Mendel returns with another handsome book dedicated to the Seminary of Quebec. Richly illustrated with superb photographs by Luc-Antoine Couturier and a wealth of historic photographs and documents, this Mendel guide is a special edition which is published to celebrate the 350th anniversary of this historic institution. Discover the exceptional heritage preserved by the priests over the centuries, in Old Quebec, but also in the countryside, as we take you to locations and interiors that are rarely accessible to the general public. The legacy of the Seminary of Quebec – its role in the establishment of the Catholic Church, in founding important educational institutions, and in the development of French culture in North America – is remarkable. Since the latter part of the 17th century, the Seminary of Quebec has maintained and preserved an exceptional architectural and natural heritage, both in the city and in the countryside. François de Laval acquired most of the land that the institution owns today, during the 1660s and 1670s. He then gave all his property to the Seminary in 1680. This extraordinary heritage, which has always served to support the work of the Seminary, has thus been under the responsibility of the same owner for hundreds of years. It is a living heritage. This book, published to help mark the institution’s 350th anniversary, presents a visual history of the Seminary, with a special focus on its historic buildings and properties. As in the first two volumes of the Mendel Guides series, Luc-Antoine Couturier illustrates the text with inspiring photographs. The historic images, documents and photographs are drawn mainly from the extensive collections of the Seminary of Quebec. This wealth of visual documentation is preserved and made accessible to the public by the Musée de l’Amérique francophone. Size: 24 x 16.25 cm; colourful pictures and photographs; soft cover. The Museum has generously contributed to this book by providing a chapter devoted to the art collection of the Seminary, written by curator Vincent Giguère. The book also includes a new series of three-dimensional drawings that depict the evolution of the buildings of the Seminary over the centuries. These drawings, prepared by Alexis Ruelland and Mathieu Lachance, under the direction of professor François Dufaux of the School of Architecture, have been produced thanks to the generosity of Laval University.